Daffodils are in bloom and the sun is starting to shine, which can only mean one thing – Spring is well and truly under way. Spring signifies a fresh stat, and it is a great time to start your Spring Clean. In the Olden Days, it is thought that a Spring Clean was in order to dust the house from the coal soot left behind after a cold winter, and the tradition seems to have stuck. It is a great time to tackle those annual jobs, or even those jobs that shouldn't be done just once a year…but always get forgotten. It is also a great time to declutter your home. I have been watching Rebecca as she declutters and she has motivated me to remove more clutter from my life. Whilst this is an on going process, Spring is a great time to really push forward with this process. 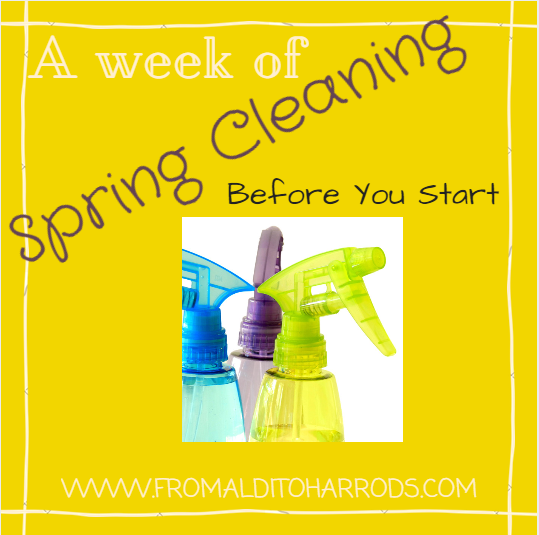 Join me for the next week where I will be posting a checklist every day to help you along your Spring cleaning. Before embarking on your Spring Clean, you will need to be in the right frame of mind. It is no good viewing this as a chore, but instead think about the positives that a Spring Clean will bring you. Small household jobs completes – paint touch ups, etc. A chance to list things you've run out of – pepper, ketchup, matches, etc. It is also important to remember that you won't be able to achieve this within a day, or even a weekend. It will probably take you a week or two to get through the house entirely. Add in your car and garden shed and you could be here awhile. Be realistic and remember how far you've come. You might want to take some “before” photographs to keep you motivated and track your progress. A few boxes/something for storing your items to recycle, donate, sell, etc. Tomorrow we will tackle the Hallway.